Food surplus processed into meals for people with a low income. We process food surplus into healthy meals for low-income households in Almere. What does Buitengewoon Almere do? Buitengewoon Almere, in English known as ‘Extraordinary Almere’ is a partnership between different organizations who process food surplus into healthy meals. These healthy meals are made for and by people with a low income in Almere. Coalition Buitengewoon Almere exists out of care service organizations and companies. Together we have the same target. Daily we work with lots of volunteers and enthusiasts to achieve activities and develop the concept of Buitengewoon Almere. 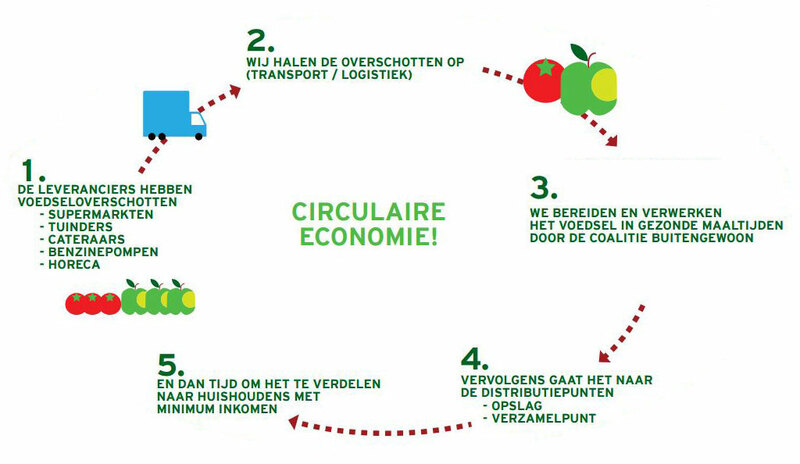 We stimulate a circular economy by collecting food surplus and processing them into healthy meals. People that do not have enough means to make ends meet. We connect organizations who help people with a low income Buitengewoon Almere. We ask those organizations to helps us to reach out to people with a low income. Companies that have food waste and/or food surplus. These are likely to be, local suppliers, growers, the catering industry and food sellers. We mediate with these companies to convince them to give the food surplus to the people who need it most. Our coalition partners are located in different districts (Almere-Haven/Almere-Buiten/Almere-Stad/Almere-Poort). These partners process the food surplus and distribute them. The fresh food surplus are provided by the connected local supermarkets. In the morning a coalition partner picks up the food surplus at for example a local supermarket and prepares these within the hour. Our coalition partners have professional kitchens and can process, distribute and store the food. Weekly we prepare and distribute 300 healthy and fresh meals! Food connects and brings people together. That is why at some locations there is also the possibility to have dinner there. If the meals are distributed in a district or picked up at a location, reusable packaging meals are being used as much as possible. And therefore we stimulate the cradle to cradle principle. This whole process takes place within 8 hours. Preparation and distribution point in Almere-Stadscentrum. Dinner capacity: 1x per week 40 guests. Bloemenbuurt. Diner capacity: 30-40 meals per week. Almere-Buiten Centrum. Diner capacity weekly 40 meals. Fill in your name, company, e-mail address and telephonenumber and we will contact you as soon as possible!